Sir George Thomas Staunton (1781-1859), Sinologist and politician, was a key figure in Anglo-Chinese relations, as had been his father. In 1798 he began working for the British East India Company in Canton (Guangzhou), where he was the only Englishman who could understand Chinese, having begun learning it as a child. By 1815, British trade with China was worth over £4 million in tea duties alone, and there was immense pressure for the Chinese to relax their restrictions. In 1816, following earlier failed missions, an embassy, including Staunton as second commissioner, was organised to seek better trading conditions and to press the emperor for the opening up of a second harbour. Chinese mistrust and British arrogance led to the failure of the embassy, with no imperial audience given. 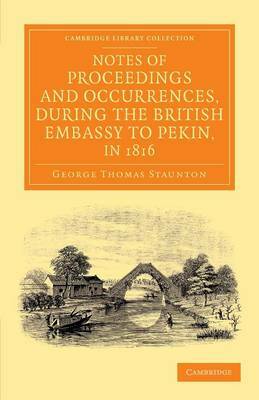 This account, privately published in 1824, is a valuable document in the understanding of the historical background to Britain's relationship with China into the twentieth century.